Note from one of our dear fans! I just wanted to take a moment to send a note to say thank you again for the concert I attended. It was back in November (November 10) in Wisconsin Rapids, WI. I was the gentleman with a bag full of lps and cds for Randy to sign. My wife and I drove two and half hours for the concert and I don’t regret a single moment. I grew up listening to the New Christy Minstrels albums, over and over, and Randy Sparks and the New Christy Minstrels are probably the only group I would travel that distance to see. I’d like to explain that I am not a ‘typical’ fan. I have spent my career working as a stage manager for live theatre. I have worked on Broadway, Off-Broadway, and at some of the premiere theatres around the country, such as The Kennedy Center and the Pasadena Playhouse. My business has been working with big names and with stars and as such I am not usually prone to being awestruck by an individual. I was awestruck when I met Randy. I was meeting the man whose life’s work has inspired me and certainly in many ways, shaped me. There aren’t many people about whom I can say that. It was as much a thrill for me to talk with Randy after the concert as it was to listen to all of you playing such great music. I can’t express how much I valued that Randy took the time out of his schedule to just chat with me and my wife. In our post-concert talk, Randy mentioned that he was working on a museum of/for Burl Ives. If there is any sort of email list for updates on this, I would gladly sign on to it. 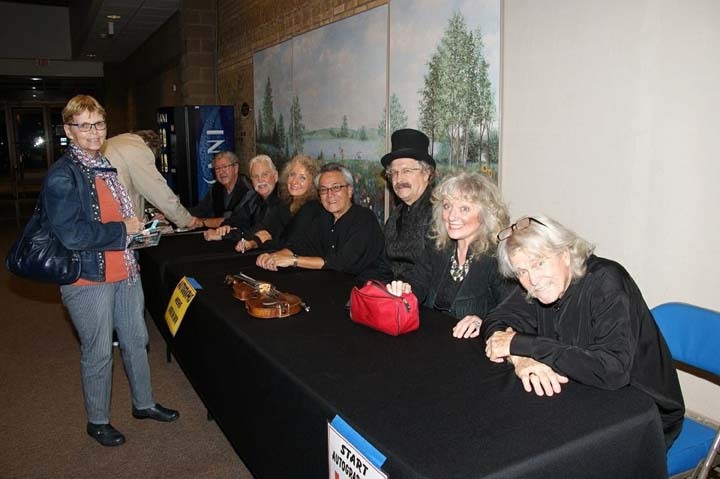 Please feel free to convey my thanks to Randy and to all the members of The New Christy Minstrels for the great concert and for continuing the work of bringing great music to the world. Thanks much, Daniel. YOU are, of course, the reason we make the effort to get here and there across the country. We meet people like you at just about every show, and what a thrill that is for me. You have to know that singing into a microphone to make a record or entertaining a radio audience…or even performing on TV is not quite as thrilling as entertaining people in the seats. Thanks for being there, and a special thank you for being so kind in your review. It’s so special that I’m sharing your message with Tom Pickles, our group historian. He’s the one in charge of putting together the new CD of oldies. The older I get the more I become aware that I’m using up resources that rightfully belong to younger people, and I’ve decided to make a special effort to earn my keep. I have been a songwriter all my life, and I’m still at it, but now I have the time to do it better, and almost continuously. What I create nowadays is old-fashioned music, of course, but what’s wrong with that? I’ve heard what the youngsters are calling ‘music,’ and music it AIN’T! P.S. Becky Jo, please forward this message to Daniel, as I don’t see an e-mail address. Our beloved VECCA-THE-SHOW-DOG has gone to Doggie Heaven. After 14 years of being in the Entertainment business, our dear show dog is resting in peace. She is up there with Eddie Boggs, and Pete Henderson. We miss you, Vecca! We have parted business ways with Producers Inc. They do not represent us any longer. Do you wish to book The New Christy Minstrels®, Still Under the Direction of Randy Sparks? Contact us directly by clicking on DROP US A NOTE in the Main Menu. Thank you so much! So sorry that we WERE NOT ABLE TO UPDATE OUR WEB SITES before April 2018! We were using Dreamweaver, and the program had a glitch that prevented us from updating, or even opening our files. We have had to RE BUILD everything from scratch, using the Sydney Theme through WordPress. This is an entire new program, and more versatile than our old software. More exciting things to be posted and updated! Please check back often to see what we are up to, now that updating the site is possible. Our NEW CHRISTY MINSTRELS FOUNDATION www.newchristyminstrelsfoundation. org web site, and RANDY SPARKS & THE COCKAMAMIE QUARTETTE (WITH FOUR PEOPLE) www.thecockamamiewquartette.com shall be rebuilt and on line shortly.